Boaters are cautioned to keep a close eye on the weather as Takla Lake is subject to sudden heavy winds that can transform the lake into dangerous whitecaps. Those with small boats are advised to stay close to shore. The Stuart-Trembleur-Takla Lake boating system is located in north central British Columbia and comprises nearly 300 km of waterway. These long, narrow lakes are among the region’s most significant recreational features. The lakes offer great sports fishing opportunities for rainbow and lake trout, burbot, kokanee, and mountain whitefish. The chain is also part of the longest migration route of chinook and sockeye salmon in British Columbia. With more than 630 km of lakeshore to explore, few developed facilities, and sparse levels of use, this chain of lakes provides a remote wilderness experience. A series of small parks have been established along the system providing protected anchorages or attractive beaches. No facilities have been developed at these sites. 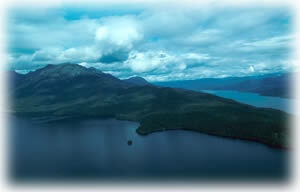 Stuart Lake, one of the largest lakes in the province at 90 km long, is the southernmost lake of the chain. The community of Fort St. James is located on the southeast end of the lake. The main body of the lake is between 6 to 10 km wide and is road accessible at many locations. The northwest arm of the lake is narrower, has limited road access, and more of a wilderness feel. This portion of the lake is very scenic with numerous bays, points, and islands. There are four marine park sites on Stuart Lake and two provincial campgrounds. The Tachie River connects Stuart Lake to Trembleur Lake. The 26 km of river can be a challenge to navigate with fast water and small rapids. Trembleur Lake is almost 50 km long. It has an irregular shoreline with sheltered bays and coves, and a scenic wilderness setting. There is one marine park site on Trembleur Lake. Limited facilities are available at the village of Takla Landing which is located 40 km north of Takla Narrows. Takla Lake Marine Provincial Park consists of three sites on Takla Lake protected as part of the Stuart-Trembleur-Takla Lakes boating system. These sites provide no facilities but may offer protected anchorages or sandy beaches. From the mouth of the Middle River at the south end, the ‘Y’ shaped lake is nearly 100 km in length, making it one of the largest lakes in the province. The Northwest Arm is 40 km long; the maximum depth of Takla Lake is 287 metres. Almost 250 km of undisturbed shoreline with sandy beaches and isolated bays are available to explore. Wildlife viewing, boating, hunting, and angling are popular pursuits in the area. There is sporadic road access on the east side of the lake. Sandy Point on the north side of the lake approximately 12 km northwest of Middle River and 6 km southeast of Takla Narrows; UTM Zone 10: 330000E – 6111500N (NTS map reference: 93N/4). White Bluff on the east side of the main arm about 48 km north of Takla Narrows; UTM Zone 9: 686250E – 6157500N (NTS map reference: 93M/9). Takla West on the west side of the main arm about 56 km north of Takla Narrows; UTM Zone 9: 682500E – 6162500N (NTS map reference: 93M/9). History: For many years prior to the arrival of European explorers, the Stuart-Trembleur-Takla lakes area was home to the Dakelh-ne people. In 1806 Simon Fraser brought the fur trade to the area with the establishment of the Stuart Lake Post for the North West Company. The company merged with the Hudson’s Bay Company in 1821, and in 1822 they named the settlement Fort St. James. Fort St. James, once the economic capital of the colony of New Caledonia and said to be the oldest European-settled community in British Columbia, saw its importance as a fur trading centre diminish in 1869 when gold was discovered 100 miles north in the Omineca Valley. With the miners came a new economic prosperity for the area that has largely been replaced by the forest industry today. Tourism is also growing, and hunting and fishing lodges can be found on all three lakes. Cultural Heritage: Although settled by Europeans almost 200 years ago, the Dakelh-ne people had inhabited the area for years prior. To the fur traders, these people became known as the Carrier people, referring to the custom of widows who carried the ashes of cremated husbands with them until a traditional potlach could be held. The Carrier people traditionally led a semi-nomadic life, congregating along lakes and rivers in the warmer months to pick berries, hunt and tan hides, and catch and process the salmon that was an important staple of their diet. The winter was spent ice fishing and trapping in smaller family units. Several Carrier groups reside in the Stuart-Trembleur-Takla lakes area including the Nak’azdli, Yekoochet’en, Takla, and Tl’azt’en. Traditional trails, culturally altered trees, and pictographs can be found throughout the area. Conservation: The three small sites of Takla Lake Marine Park protect natural areas and contribute to the role of the Stuart – Trembleur – Takla lakes system as a backcountry boating destination area. Wildlife: Diversity of the terrain and types of vegetation support abundant wildlife populations. Moose and black bear are plentiful. Other less visible species include mule and white-tail deer, wolf, and grizzly bear. Furbearers in the area include the lynx, fox, beaver, marten, fisher, otter, and wolverine. There are opportunities for canoeing or kayaking in this park. Boaters are cautioned to keep a close eye on the weather as Takla Lake is subject to sudden heavy winds that can transform the lake into dangerous whitecaps. Those with small boats are advised to stay close to shore. Cycling is permitted and must keep to roadways. Bicycle helmets are mandatory in British Columbia. Popular sport fish include dolly varden, rainbow trout, lake trout (char), kokanee, and freshwater ling cod (burbot). Anyone fishing or angling in British Columbia must have an appropriate licence. Refer to the current BC Freshwater Fishing Regulations Synopsis for specific catch quotas and regulations; the Stuart-Trembleur-Takla chain of waterways is in Region 7 (Omineca-Peace) – Zone A.
Wilderness, backcountry or walk-in camping is allowed, but no facilities are provided. Practice “Leave No Trace” camping; choose a camp spot that will do the least damage to vegetation; do not damage live vegetation; if you pack it in, pack it out; dispose of personal waste or waste water at least 100 metres from the lake or any creek.